Now onto February’s income report! Alright guys, so we’re sorry we haven’t been posting income reports for the last couple months. To be honest, we’ve been so busy and there’s been a lot going on that we ended up putting it off. Now February was an interesting month; a lot of things happened to disrupt the flow of the blog. The first thing to upset it was when Silas caught a tropical disease and became bedridden for weeks after arriving in Bali. He was sick for almost the entire month (crazy right?!) and I took care of him. So as you can imagine, this slowed us down a lot. Second, due to some technical issues with our domain name provider, our site was down for around 4 days. This meant that we lost a good amount of income and pageviews. Now Pinterest doesn’t like this. In fact, if they see that there’s a broken link (a pin going to a page/site that’s down), they’ll bury that pin in the algorithm. So we’ve been working on restoring things to how they were (and surpassing it) since that happened. Thankfully though, I’ve had some really awesome friends I’ve met through blogging help us out during this time through pinning our pins to help us with the Pinterest algorithm. It just shows you how important it is to reach out and network. Remind people that reaching over $10k a month seemed so far off until it happened, but we did start out making $0 and worked hard to get to where we are. With us both being really sick in February and the technical issues of the site going down, our numbers took quite a dip. However, we were still very happy and grateful for what we made. It’s amazing that we were able to make over $10k that month and we feel very blessed to make that sort of income. It also just goes to show you that when you put the hard work in early on, it’ll perform for you on your off months. See below for the steps on starting your own money-making blog. I just wanted to say that I know it’s so easy to look at other people’s income and wonder how you’ll ever get there. 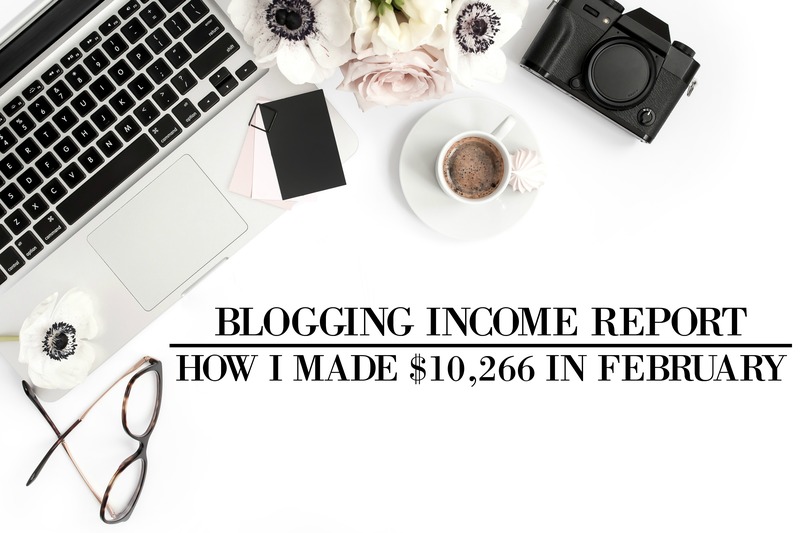 But I need you to know that I started out with $0 with this blog. I didn’t have thousands in the bank when it began, but through hard work and the steps and tips I give you, I was able to start making over $10k a month. We’ve decided that for every monthly income report we do, we’ll be featuring a blogging question from you guys. This is the third time we’ve done this, and it’s been pretty fun so far! It turns out that with any niche you do, there will be plenty of other who have done it before and have a huge audience. But guess what? It actually doesn’t matter! There are TONS of people on the internet that you can reach. Those few big bloggers who are doing the exact same niche you want to do, haven’t reached out to everyone out there that might be interested. You can easily get your own audience that LOVES what you do! Now how do you set yourself out apart from those other bloggers who are in your same niche? The easiest way to do this is by going onto successful blogger’s sites in your niche and see what they’re writing about. Then, see where you can add value where they’re not. Check out multiple bloggers to understand what’s being said and see what you have to offer that is unique. So for example if you’re a DIY person, and this bigger blogger is doing complicated DIY projects, try to find a way to do similar DIY’s but make them easier (for beginners). Now remember, the way these successful bloggers got to be successful was through consistency. They didn’t give up even when numbers were really small starting out. They kept on going until they had success. This is another way you can make your blog’s niche stand out. Continue to provide great content with awesome value when others give up. Let us know which one you want answered for next month’s income report! 2. What’s the best way to get accepted onto a group board? Lastly, just remember that in a year from now, you’ll wish you started today. This is something Silas always reminded me of when we were first starting out. So where do you want to be in a year from now? Would you rather be surfing Facebook or watching Netflix after a hard day of work at a dead end job, or would you rather be bringing in a new income stream and working from home? Amazing Article. thank you for the information.